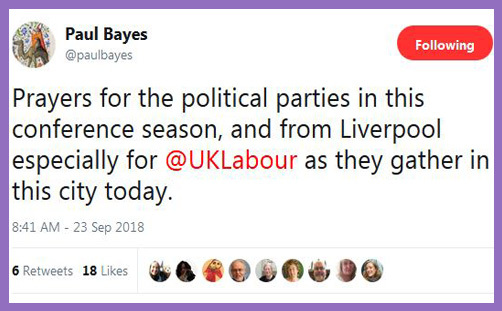 The Bishop of Liverpool Paul Bayes exhorted his Twitter followers to pray for the party conference season, but he reserved an especial welcome for the Labour Party, whose conference is taking place in his diocese. Let’s not pretend that this isn’t an episcopal partisan signal of political virtue: the Bishop would not have especially welcomed the Conservative Party Conference to Liverpool, and he certainly wouldn’t have especially welcomed the Ukip Conference. The latter took place in Birmingham last week, and the former is scheduled to commence also in Birmingham this weekend. The Bishop of Birmingham David Urquhart didn’t tweet an especial welcome to the Kippers; nor will he especially welcome the Tories. Perhaps he isn’t a partisan-signalling kind of bishop. He will be fellowshipping with the Conservative Christian Fellowship, but one might expect a bishop to do cordial Christian things with fellow Christians. What he won’t be doing is welcoming the Conservatives especially to Birmingham, just like he didn’t welcome Ukip especially, because there’s a danger of such an especial episcopal welcome being misconstrued as a partisan greeting, and that would be divisive, because Bishops are supposed to be a focus of unity. So no, he won’t do that. So why did the Rt Rev’d Paul Bayes put out the red carpet for Labour? Why proffer a particular handshake to Jeremy Corbyn and give a special hug to John McDonnell and broadcast a Twitter ovation to the whole Labour movement, signalling that they are especially welcome to Liverpool? “The archbishop of Canterbury, Justin Welby, has done McDonnell a mighty favour”, observed Polly Toynbee in the Guardian. McDonnell “has gone out of his way to praise the Archbishop of Canterbury, a pillar of the establishment”, wrote Rachel Sylvester in the Times. “In his speech which deplored ‘the divine right of kings and the aristocracy’ he nonetheless praised the Archbishop of Canterbury, Justin Welby”, said Quentin Letts in the Daily Mail. “He praised the Archbishop of Canterbury, who has recently criticised zero hours contracts”, wrote Tom Peck in the Independent. Justin Welby has been well and truly appropriated by the Labour Party to the cause of Corbynomics. There is no objection to this from Lambeth Palace, principally because the Archbishop of Canterbury approves this message. The Church of England in Liverpool is following the Church of England in Manchester, who gave an especial welcome with prayer to Jeremy Corbyn and the People’s Assembly conference during the Conservative Party Conference a few years ago. Neither the Bishop nor the Dean of Manchester tweeted an especial welcome for Theresa May and the Tories to their diocese; no, the red carpet was rolled out to keep the red flag flying there. Would they have given an especial welcome to a Ukip conference? No, of course not. The sociological and economic factors upon which Church of England bishops now choose to focus have fused with the policies of Jeremy Corbyn’s Labour Party. As the narrative goes, he opposes racism in all its forms, repudiates Little-Englander xenophobia, rejects individualism and dog-eat dog capitalism, and lauds communitarianism, jobs, security, housing and workers’ rights. So does the Bishop of Liverpool and so does the Bishop of Manchester. And so does the Archbishop of Canterbury. And so does Theresa May. But the vicar’s daughter doesn’t get an especial episcopal welcome anywhere for her conference. Her notion of the common good isn’t theirs. She is not their political role model or moral guide, and offers no hope for the poor and homeless, as the Bishop of Sheffield Pete Wilcox observed. No, it is Jeremy Corbyn who offers protection, a lot of love and affection, whether he’s right or wrong (..sorry). It sounds trite, but this is the message the Bishops are broadcasting: Labour is lover, guardian, protector, preserver, model of faithfulness and healer of sorrows. Corbyn promises economic justice and societal salvation, heralding judgment day for the evil fat-cats of Wonga, Amazon, and the bankers and selfish shareholders who care about nothing and no-one but themselves. When Corbyn becomes Prime Minister, the rich Tories will be bulldozed through the eye of a needle while everybody else is taking it easy with the camels en route to the New Jerusalem.